Put a song of praise in your child's heart! With the Horizons Preschool Sing Along Music CD, your preschooler will learn 17 fun-filled, God-honoring songs such as "Say to the Lord I Love You." The Sing Along Music CD is included in the Horizons Preschool Curriculum and compliments lessons 1-180. Can also be used independently. Looking for a resource that generates a love of Jesus in your child during his tender years? 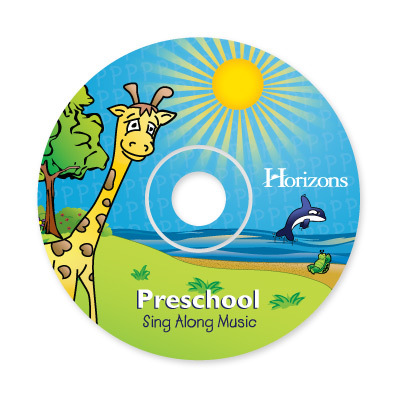 The Horizons Preschool Sing Along Music CD from Alpha Omega Publications will capture your child's heart with 17 upbeat Christian songs that will transform and keep him bubbling over with God's love throughout the day! Designed to be used as a companion resource to the Horizons Preschool Curriculum, this delightful music CD influences the sensitive soul of your homeschool child with wonderful children's tunes such as "I Know He Loves Me Too," "God Made You," "God Made Me," "He's Still Working on Me," "Skeeters and the Bed Bugs," " Heaven Is a Happy Place," "I'm a Little Candle," and more! And that's not all! To make sure your child doesn't miss a beat, this entertaining CD also includes the lyrics so you can teach the words to every song correctly. So why wait? Grab the CD player and a microphone and give your preschooler a fresh love for God with the Horizons Preschool Sing Along Music CD. Add a copy to your shopping cart today and awaken your child's heart to the love of God!